FAST MaxJet Precision Carb Jets UNIVERSAL - Dezod Motorsports Inc - Home of the automotive performance enthusiast since 2002. Often you will hear a racer say, “I made two jet changes, but the engine still didn’t run properly.” The reason for this relates directly to the jets being used. Other jets are mass-produced with a wide tolerance, then plated. Many of these jets use the same orifice size with the only difference being different angle tapers that supposedly change the flow-rate characteristics. Other jets also use a slot that requires a special, expensive tool to install. Ultimately, these slots become damaged, and that damage creates a turbulence that severely affects the fuel flow by as much as 50 percent. MaxJet™ Precision Carb Jets are available from 0.050” to 0.120” in gasoline jets and from 0.121” to 0.140” in alcohol jets. 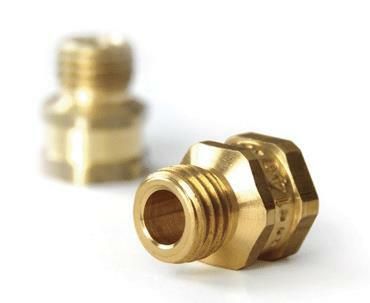 Sizes are in 0.001” increments and are compatible with all known racing fuels. MaxJet™ Precision Carb Jets are easily matched to Holley jets; simply find the Holley size that you are currently using on the left and cross over to the MaxJet™ column to find the corresponding part number.